Breaking news from the Denton Record Chronicle about a leaking gas well. Fracking in neighborhoods and near schools puts families and Texas children at risk. Regardless of what caused gas to emanate from an abandoned water well in southern Denton, experts say it could happen again and with more serious consequences as more gas wells in the Barnett Shale reach the end of their productive life. Below are some highlights from the story. As you read this story, think about how HB 40 has left us with no way to protect ourselves and at the mercy of the Railroad Commission. 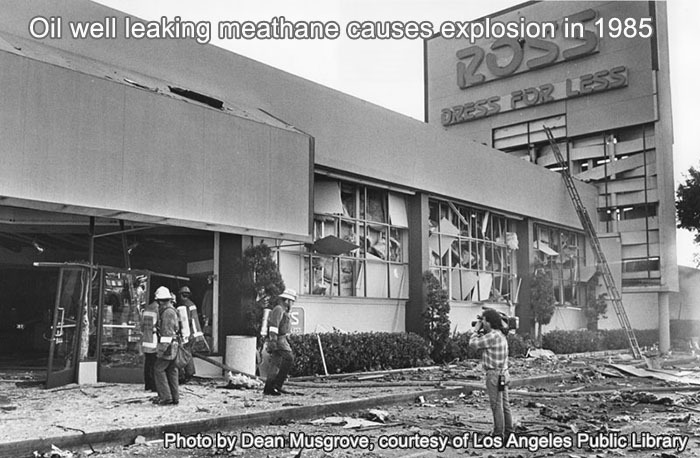 How long the methane gas leaked. All the areas where methane gas may have migrated. How long–past 2 years–gas wells on Guyer High School property went uninspected (The RRC no longer keeps records older than 2 years.). Over 221,000 Texas children attend school or daycare within 1500′ of oil and gas facilities. “Gas migration may cause methane to accumulate undetected inside basements of homes and other structures.” Conditions could lead to explosions. House Explosions in Bradford Pennsylvania Tied to Migrating Methane Gas from Drilling Activity. City gas well inspectors are not qualified to insure our children’s health and safety. As wells age, they can leak. Barnett Shale wells are getting old. This could happen again with serious consequences. Some schools get fracked more than others. The Texas Railroad Commission will not keep your children safe. H.B. 3403 by Terry Canales would protect Texas children by allowing cities to establish up to a 1500′ foot setback from oil and gas facilities. Call and write your Texas Representative and ask them to co-author this bill. Canales’ constituents should not take the action above. Instead, please thank him for his leadership. Oh yes, I have known for several years that this natural gas migration to water aquifers/water wells is possible and is likely to continue and increase. This is a very good article. Our OLD and INACTIVE gas wells are harming us and our children, long after they’ve ceased to function. And we’re still getting new ones, so that private companies can keep on profiting at the expense of RESIDENTS’ HEALTH????? Overturn HB40, reform the Texas Railroad Commission, restore local control, and STOP THE INSANITY NOW. “Reform the Railroad Commission”?? In my opinion, there is only 1 way to fix it. The RRC should be taken off of public funding–it should be allowed to solicit it’s funding from the O&G industry(and other polluting entities) in Texas. A lot of tax money will be saved, and NOTHING WILL CHANGE. Then, if a proper regulating authority could be established, that would be good. We need to stop using fossil fuels. We don’t need them. I agree–and the sooner the better. This would be a good place to post that Schlumberger (I think it was?) presentation that shows how 10% of wells leak immediately, x% leak after y years etc…. Basically all of these thousands of wells are going to be leaking stuff sooner or later….